There is nothing out there compared to this mousse. It took me a while to get used to the texture and the finish of the product. However, I am happy to report that I will be repurchasing it in the future, as I am happy with the overall results. This mousse creates beautiful volume without being sticky. I have thin, baby-fine hair and find that this gives me natural volume with a little shine too. I only need a small amount so this lasts a long time for me. Love! The Mousse au Lotus Volumatrice is a godsend! I’ve always had a great head of hair up until recently. Due to age and stress I have lost the volume in my hair. After using this styling mousse the first time, I was smiling once again at my full head of hair! I hope to start using the whole line of Leonor Greyl products! Just wonderful– easy to apply, not sticky– and in combination with volume shampoo– hair has never looked better!! This Mousse is a miracle worker! I have naturally curly hair and I can also use this for times I want to wear it straight. It brings serious volume and hold without any stiffness or heaviness. It gets curls more defined and voluminous and provides the best volume for that perfect blowout! I LOVE this product. It is worth every penny! 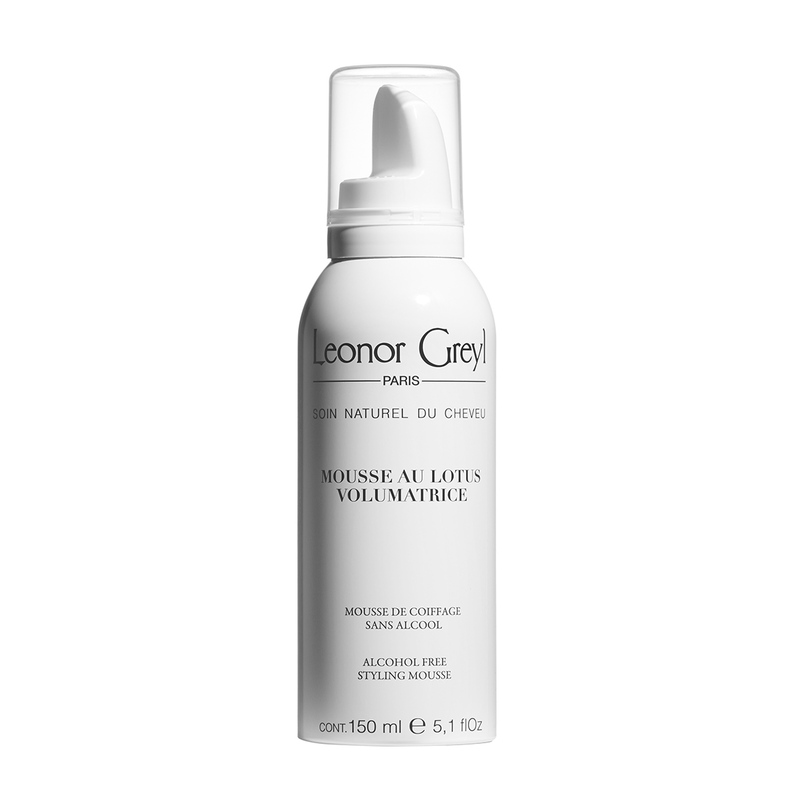 Mousse au Lotus Volumatrice… This mousse root to end creates the most malleable volume which I have found in my years on set. It’s great for all textures and is supple enough to build on… The more you apply the more memory you are able to achieve for your style.. But you must compensate for texture. The thicker the hair generally I apply about two to three silver dollar size amounts of mousse. Per medium to fine; one to two silver dollar size of mousse. I’m thrilled to have Leonor Greyl at my Beverly Hills Salon! Even though I have my own product line, I find Leonor Greyl to be the perfect compliment. My favorite “go-to” products are Eclat Naturelle (fantastic for molding & styling), Mousse au Lotus Volumatrice (lots of beautiful volume), and Huile de Palme (truly a cult classic that I can’t live without). Shake can, tip slightly and release mousse in your hand. Mousse will build slowly. Apply to damp or dry hair everyday is necessary.